The value of experience – from the King’s Speech. 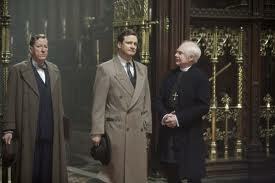 One of my favourite moments from one of my favourite films comes in “The King’s Speech”, when Bertie (King George VI – Colin Firth) confronts his speech therapist, (Lionel Logue, played by the brilliant Geoffrey Rush), revealing that he now knows that Lionel – who has been treating him for some time – actually has no formal qualifications. It’s true. I’m not a doctor and yes, I acted a bit, recited in pubs and taught elocution in schools. When the Great War came, our boys were pouring back from the front, shell-shocked and unable to speak and somebody said “Lionel, your’ very good at this speech stuff. Do you think you could possibly help these poor buggers”. I did muscle therapy, exercise, relaxation but I knew I had to go deeper. Those poor young blokes had cried out in fear, and no one was listening to them. My job was to give them faith in their voice and let them know that a friend was listening. That must ring a few bells with you Bertie? You give a very noble account of yourself. Make inquiries. It’s all true. Inquiries have been made! You have no idea who is breathing down my neck. I vouched for you and you have no credentials. But lots of success! I can’t show you a certificate – there was no training then. All I know, I know by experience. And that war was some experience. Lock me in the tower. That’s the bit: All I know, I know by experience. As Knowledge Professionals, I believe that one of our most important tasks is to discover, surface, and give voice to experience. When I’m explaining or facilitating a Peer Assist process, I make a point of emphasising the difference between people giving opinion and people sharing experience. We can Google for opinions; they are cheap and easy to come by. Experience, in contrast is a more precious commodity. It’s earned, it’s won, it’s personal, and it’s unarguable. This is why story is such an effective medium for the transfer of knowledge. People tell stories about their experience. If they presented or wrote them down, they inevitably filter, over-summarize, and post-rationalise with opinion and analysis – and it’s in that process when the waters get muddied, the purity of experience is lost – along with messages embedded in the tone of voice and body language. I’m not denying that there is value in KM processes and tools which elicit opinion and advice. Lots of discussion forums work well on that principle. Great. Let’s bank that. But let’s not confuse giving opinion with sharing experience. How many opportunities do people in your organisation have to share experience, or listen to others sharing theirs? How many experience-sharing tools are in active use in your organisation? And do they, as Lionel Logue might have said – give you “Lots of success”? I stumbleupon on a daily basis. It’s always useful to read through content from other writers and use a little something from other websites.